Learn to dance like the Strictly stars in our fun and friendly Ballroom and Latin classes. No previous experience is necessary and you don’t even need a partner! Adults’ classes are every Wednesday evening at 7:00 (beginners) and 8:30 (improvers). Children’s beginners classes are held on Saturday mornings from 9:15. Adults’ classes are run in courses. Each course lasts for 6 weeks and costs £30 which includes a 30 minute practice session each week. The fee is payable at the start of each course and is not refundable. Numbers are limited so call Linda on 07855 818277 now to reserve your place. David is a fully qualified member of the International Dance Teachers Association, with many years experience as a competitor and teacher. He started dancing at the age of 8, and he is also a qualified competition adjudicator and scrutineer. His classes are fun and varied, and he has a 100% success rate in teaching absolute beginners to dance. 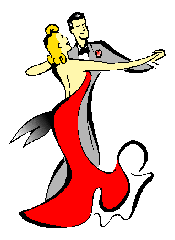 Waltz, Foxtrot, Tango, Quickstep, Cha Cha, Rumba, Samba, Jive, and Salsa are all covered, plus the more popular sequence dances.